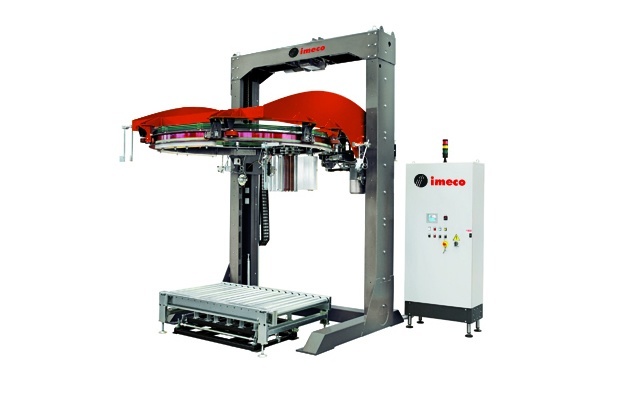 Automatic machines designed to apply a mechanically pre-stretched film to a pallet load. ELECTROMAGNETIC FRICTION ADJUSTABLE FROM CONTROL PANEL. FILM CUT, CLAMP AND WELD UNIT SELF-ADJUSTING FOR ANY SIZE OF PALLET. HEAVY DUTY BEARING SUPPORT WITH EXTERNAL PINION DRIVE FOR EASY MAINTENANCE. CLAMP, CUT AND TUCK IN UNIT FOR THREADING THE STRETCH FILM TAIL INSIDE THE WRAP. SUITABLE ALSO FOR NET FILM. ROPING SYSTEM: REDUCING THE FILM TO FORM A ROPE TO ENSURE MORE EFFECTIVE LOAD STABILISATION.